SALEM, Ore.--(BUSINESS WIRE)--Today, Have a Heart opened the doors of its first store in Oregon. The Salem location will bring 20 jobs to Willamette Valley, in addition to the company’s knowledgeable, friendly staff and vast menu of lab-tested and locally-sourced flower, pre-rolls, concentrate, edibles, and topical cannabis products. Have a Heart’s Chief Executive Officer Ryan Kunkel and Chief Operations Officer, Ed Mitchell were on-hand for the store’s green-ribbon-cutting ceremony. The new shop is located at 4618 Portland Rd. NE #110, just off the 99E, next to Dutch Bros coffee and a stone’s throw away from SunRise Espresso, the Original Pancake House and the Oregon Indoor soccer facility. The location provides easy access not only to local Salem residents and visitors but also the surrounding communities. Founded in 2011, Have a Heart started 2018 with five operating locations in Washington state. 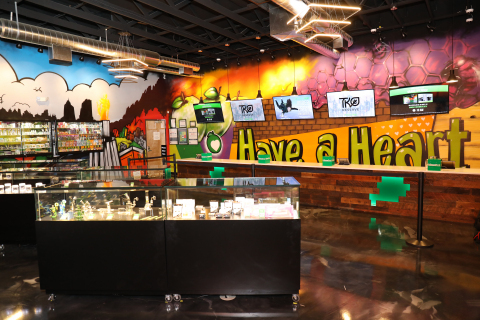 Have a Heart was recently rated by High Times as one of the best cannabis dispensaries in the United States, and earned the distinction as Seattle’s top-selling cannabis retailer from the Puget Sound Business Journal. The company recently closed $25 million in series A financing, the largest private financing round for a pure-play U.S. retail cannabis company to date. Have a Heart has retail stores across the nation including: Washington, Hawaii, Oregon and California, with additional stores opening soon in Iowa and Ohio. The company has more than eighteen applications pending, including in five additional states. In addition, it has more than twenty sites under negotiation with potential merger partners in another four states. Have a Heart, founded in Seattle, Wash., in 2011, owns and operates licensed cannabis retail locations in Washington, California, Hawaii and Oregon. The company has robust plans to expand nationally. Have a Heart employs more than 400 people across the United States. The company recently established one of the industry’s first agreements with organized labor, the United Food and Commercial Workers International Union (UFCW). Have a Heart is recognized for its support of legislation to promote the safe and compliant growth, manufacturing, distribution and consumption of cannabis in states that have made it legal.